There are many travelers’ trails in the world. The original “trail” was the Grand Tour, traveled by Europe’s Elite for hundreds of years and following a standard itinerary. South America has the Gringo Trail and the Hippie Trail takes you to India. Most Americans are familiar route 66, and others have chosen to trace the steps of Marco Polo. The Banana Pancake Trail is just another trail. The loving name has it roots in the many small guesthouses serving banana pancakes to the budget backpackers throughout Southeast Asia. Some extend it as far north as China and as far west as India. The trail is well worn. As we travel the path, we do it along with millions of Europeans, Australians, Canadians, and even a few other Americans. While we definitely aren’t discovering uncharted territory, and there seem to be no beaches left in Thailand that are hidden from the masses, (and besides the wireless would be slow) we hope the trail will still offer us some surprising experiences. This blog is a collection of our musings of the mundane and the inspiring that will meet us along the way. The Cook Islands, New Zealand, and Australia are not a part of the trail but we didn’t think that was a good reason to leave them out of this adventure. Oh, and because I know you would be disappointed if I didn’t – enjoy some Banana Pancakes. How are the pancakes? LOL Wishing you well and please Tim, don’t get lost in the jungle anymore. That was scary to read that. Please be safe you too! Enjoying the pic’s and your adventure. 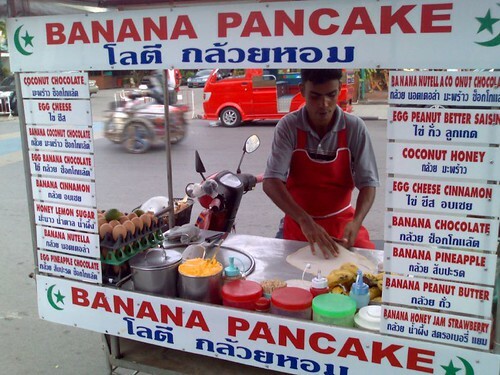 I too am a big lover of the banana pancake, ooh this picture takes me back to (almost) every breakfast time in SE Asia…good times! Just came across your blog, it looks great – where are you guys at the moment? Thanks Kat – we’re in Singapore – towards the end of our 5 months in Asia. Hi, I’ve graduated high school and I’m looking to do a cross asia trip that gets me from indonesia, to malaysia, to thailand and up the banana pancake trail. But I was wondering, is there a map marking out the trail?? The best answer is that the trail isn’t just one path. You’ve picked the main countries on the BP trail. I would pick a direction and some places you definitely want to go – and you’ll figure out a lot of the rest once you’re there. If you want a guide of what we did – here is the actual route we ended up taking. http://www.tripline.net/trip/Our_trip_so_far-7013246240461003BD5DBC1C7FD03ECB We planned a route before we left but it didn’t look like the one we actually traveled.